You may think that going keto means giving up certain summer drinks like sangria. Luckily, this treat based on red wine, vodka, sugar-free club soda, and lime juice is as keto as it gets. Low-carb sangria is quick and easy to make and tastes like the Spanish classic. If you really want to go for it — invite some friends over and make some low-carb tapas or other keto recipes and fill up a large pitcher of red wine sangria. It’ll be like having a bit of Spain in your living room. Living a low-carb lifestyle doesn’t mean you have to give up on the things you love. And who doesn’t love sangria? Read on to learn about some of the surprising health benefits to this sangria recipe. One glass of sangria has a carb count of just 4 grams per serving and is completely free from added sugar. Avoiding sugar isn’t just a cornerstone of the keto diet, it’s the best way to lose weight and maintain steady energy — even after a day of sipping on low-carb sangria. You can enjoy this low-carb recipe and stay in ketosis because it calls for Zevia or a sugar-free club soda. Zevia is a stevia-sweetened soda that has the flavor of the real thing but is actually sugar-free. This easy switch makes this keto sangria a perfect swap out for the fruit and orange juice you’d usually add to this Spanish drink. A low-sugar sangria is a good idea even if you’re not keto. Excess sugar consumption can cause everything from diabetes and metabolic syndrome to cancer[*][*] In fact, sugar has been correlated with several different forms of cancer including breast, colon, and pancreatic cancer[*][*][*]. The list goes on and on, but the takeaway is always the same. For a healthier life, you want to avoid sugar (especially in its refined forms) as much as possible. Antioxidants are compounds that protect your cells and tissues from reactive oxygen species (ROS). Your body creates ROS naturally through the normal wear and tear of life, or from outside sources like pollution, pesticides, tobacco smoke, or heavy metals[*]. Excessive ROS have been linked to several disease processes like diabetes, heart disease, neurodegenerative diseases, and various cancers[*]. Antioxidants neutralize these unwanted invaders and bring your body back into balance. Aside from generally keeping your body healthy and in balance, antioxidants have some other interesting potential benefits that you should know about. Red wine is well known for being high in antioxidants. Specifically, the antioxidant compound resveratrol. In animal studies, resveratrol was found to have insulin-like properties. More research needs to be done, but this could be good news if you have insulin resistance or any related disorders[*]. Another study done in rats found that resveratrol had neuroprotective effects on brain damage caused by excitotoxins. Excitotoxins are a group of chemicals that have a toxic effect on the brain[*]. They’re usually found as additives in processed foods. You may have also heard that red wine is good for your heart. A test tube study confirmed that anthocyanins (another antioxidant found in red wine), were able to inhibit the oxidation of LDL cholesterol as well as platelet aggregation in a test tube study. These are the two main events involved in the progression of heart disease[*]. A few drinks can certainly make you feel younger in the moment, but this low-carb sangria may actually help you look younger too. The combination of red wine (rich in antioxidants) and limes (rich in vitamin C) makes this a perfect cocktail for skin health. Limes are a great source of vitamin C. In fact, one lime takes care of 35% of your daily vitamin C needs[*]. Vitamin C also plays an essential role in collagen production. And collagen is the compound that keeps your skin looking young[*]. In addition to its important role in collagen production, vitamin C also acts as a natural sunscreen. It can protect your skin from UV rays and block potential sun damage[*]. The benefits of antioxidants are back for round two. To keep your skin cells happy you need to have enough antioxidants to combat the oxidative damage caused by ROS. In fact, oxidative stress by ROS is a major contributor to aging skin[*]. As the antioxidant vs. ROS battle carries on in every cell of your body, red wine’s got your back — so relax and enjoy the benefits. Remember: alcohol is dehydrating, which is terrible for your skin. Just remember to drink a tall glass of water between each cocktail and you should be just fine. With all of the flavor of the real thing, minus the fruit juice and carbs — one sip of this low-carb sangria and you’ll swear that you’re sitting in the Spanish countryside. Switch out the red wine for some white wine like pinot grigio to make a white sangria. Add some fresh fruit like blueberries or lime slices for a little extra fruit flavor. With only 4 net carbs, this keto red sangria is as perfect for tapas night as it is for hot summer days. 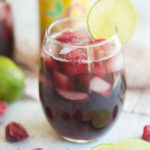 A low-carb sangria keto recipe with a hint of lime juice and delicious fruit flavor. Sugar-free and perfect for a low carb-lifestyle. Only 4 net carbs per glass. Combine ingredients into a glass. Stir gently. Add ice if desired. In the write up you state 2g carb per glass, but later in recipe 4g net carb per glass. Is this because you need to add 2 for alcohol to stay in Ketosis?? ?